Eagle Group's mission is to provide mutual support for current military, military veterans and families. Website is currently being updated. We appreciate your patience. This meeting is our spring career panel, and for the first time ever, this panel will consist entirely of hiring managers! The panel will consist of Kevin White, Operational Excellence Manager at 3M; Eloisa Diaz-Insua, Director at PwC; and Melissa Joseph, Environmental Health & Safety at Comcast. The panel will be moderated by Eagle Group board member Les Hoffman, and will explore the hiring manager perspective on seeking a role at a firm, to include how to best present yourself in the application process while leveraging your veteran status. Our career panel meetings historically have been the most popular Eagle Group meetings of the year. With this panel being exclusively hiring managers, we expect this month’s meeting to be the most in demand and well attended Eagle Group event to date. Don't wait... please register now, and plan to join us as we honor, network and share in the great camaraderie that is unique among veterans and our families! • PLEASE pre-register by 1:00 p.m. on Friday, March 22nd (by doing so, you will be you pre-registered on the security list and it will help organizers plan for enough space and food). • At the event: when you arrive, sign-in at Cargill Security Bldg 9320. 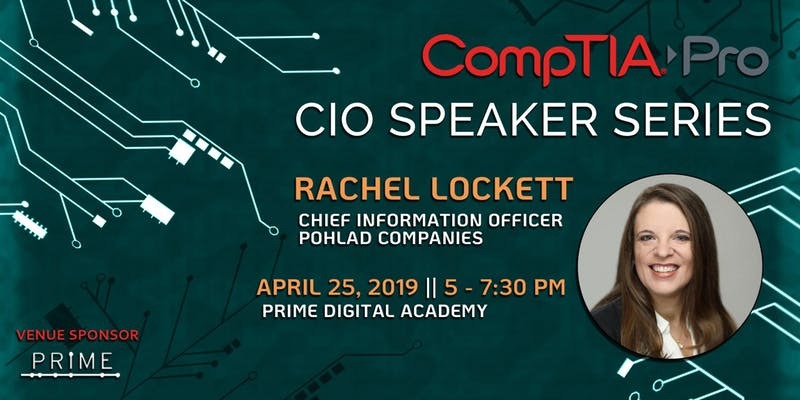 ​Join us for an evening of networking and hearing from CIO Rachel Lockett of Pohlad Companies as she discusses the evolution of her career in the tech industry. We will dive into Rachel's background to learn when she became interested in a career in tech and what steps she took to make her way into the role which she currently holds. Rachel will answer some of your questions as well as some fun, off-the-wall inquiries as well. You will gain insites to how you can leverage some of Rachel's experience to advance in your own career. Parking is available in the Gateway and Jerry Haaf Memorial parking ramps. Don't miss this great opportunity to network with Rachel and others in the inneapolis/St. Paul area. Listed below are some of the opportunities you will find at our job fair, additional companies being added weekly! Full Time and Part Time Direct Hire, Temp to Hire, and Seasonal in Light Industrial, Professional/Clerical, Hospitality, and Skilled Industrial. Jobs and offices are located all over the Twin Cities Metro. Benefits offered. ATTN: Due to the enormous success and growth of our Battle Buddies Career Track Sessions we are splitting into 2 groups. We will have a Battle Buddies WEST and a Battle Buddies EAST. What: Eagle Group "Battle Buddies Career Track"
Who: Those vets looking for one-on-one assistance for job search questions, networking or moral support and those who wish to mentor/coach in these areas. How: Register HERE or at the facebook page. When you register, please note topic of interest (an area where you especially need some help). We will meet when we have a "critical mass" of at least 3 or 4, so PLEASE register in advance. We will meet weekly, for a more intimate "break out" session from our larger, monthly Eagle Group meetings. We will continue these meetings if there is enough interest. The purpose is to provide volunteer "battle buddy" (peer) support to transitioning veterans. Depending on vounteer resources, "batttle buddy" assistance can help you work on your most pressing needs. These may include, for example, assistance with resume writing, elevator pitches, networking/contacts, and/or moral support if someone is really down - you name it. This is not a mandatory meeting, but an opportunity for those who wish to contribute and work one-on-one in support of a transitioning veteran. You will be able to bring food into the new venue (just no alcohol please.) There are many options for food within walking distance. What: Eagle Group "Battle Buddies EAST Career Track"
We are SUPER excited to have our first event coming up on Tuesday, Feb. 5th, 2019 at Davanni's Pizza East. Thank you so much for your impressive and generous support thus far for our Honor Flight Twin Cities initiative! Your desire to support our elder statesmen brother and sister veterans is heartwarming! I understand that a technical glitch on my end prevented many of you from being able to donate. My apologies. This issue has been remedied and the site is live again for members who wish to contribute. If you tried to donate initially and were unable to do so, I would be most grateful if you would try again at the donation link. As a reminder, the Eagle Group will match all funds donated up to $500 to help reach our goal of sending two veterans on the next Honor Flight. ALL funds raised as a part of this initiative will be donated in full to Honor Flight Twin Cities! Again, thank you for your generosity and consideration of those World War II and Korean War Veterans who sacrificed so much to give us the freedom and protection we enjoy today. Let’s see how many of these heroes we can send to Washington D.C. for the recognition they rightfully deserve! general within the ranks of the bank and in the community at large. With this generous donation, U.S.
metropolitan area will be initiated in the eastern part of the Twin Cities. Applications are due January 3. Veterans in Residence offers United States military veterans and spouses fully-sponsored workspaces to help entrepreneurs build and grow their businesses. Each cohort member receives six months of coworking space at WeWork along with education, mentorship, networking, opportunities to share what they are creating, and connections to the local business and investment communities. Veterans in Residence is created by WeWork and powered by Bunker Labs. You might be a good fit for Veterans in Residence if you are a military veteran or spouse and you are at the idea stage or in the early stages of developing your product or service, or if you’re a consultant or independent contractor looking to significantly grow your business in 2019. The Application Process The application takes just a few minutes to fill out and can be accessed here. If you have any questions about the Veterans in Residence program, send them my way! Your feedback will help make our programs even better so please take this survey NOW! We have had huge changes in September and we need your feedback. Our grant funding to support our meetings was officially announced on September 27th. Click here to see the MDVA press release! Eagle Group of Minnesota Veterans, Inc.
A 501(c)(3) charitable organization, Eagle Group's mission is to provide mutual support for current military, military veterans and families. Here, you will find programs on entering civilian life, on transition, and on leadership and community. In everything we do, we endeavor to foster networking with a spirit of camaraderie, because we greatly appreciate your service to our country.